The estate’s vineyards at Le Caggiole, described by Repetti in his famous Dizionario as: “a land habitually clad in a wonderful vegetation of choice vines and ancient olives…”, cover ten hectares, of which 75 percent are planted with Prugnolo Gentile, 15 percent with Canaiolo Nero and the rest with Mammolo and white varieties. The soils are medium-textured and a perfect environment for the vines, which give excellent results. 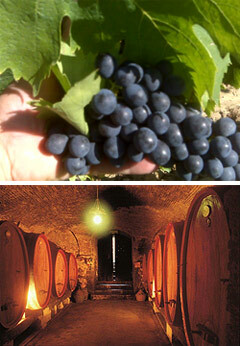 Vinification is carried out in a cellar near the vineyards, while the Vino Nobile is aged both in the 14th century cellars in Montepulciano and in another rented cellar, with a total capacity in wood of 900 hectolitres. Bottling is carried out in the Montepulciano cellars, to the satisfaction of visitors who have the chance of watching this operation in process.